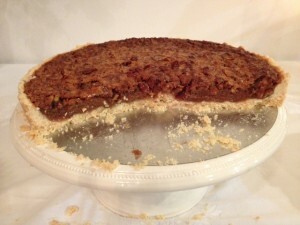 Dear Friends: Thank you for all the nice comments on my previous post about my mother’s pecan pies. I feel compelled to follow up today, as there is so much interesting pecan-pie-related news, some of it on the front page of the New York Times (“No Holiday Pecan Pie? Thank China, Feral Pigs and Ill-Timed Rain”). 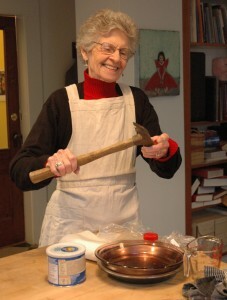 But to go back, I need to clarify that the hammer in Mom’s hand was for cracking pecans, an obvious oversight by clueless me, but recognized immediately by cook Michael. Mom probably brought the nuts with her from New Mexico, a state that produces pecans, but I think she learned to make pecan pies in Texas, my father’s home territory, and where we briefly lived when I was a child. OK, so what’s the connection with pecans and feral pigs and China that has driven pecan prices up over 30% this year? Record rainfall last spring and summer in Georgia and South Carolina, summer drought in Texas and Oklahoma, a disease called scab, heavy fall rains in Texas and a sporadic harvest. And then those darn Texas feral pigs moved in to take advantage of the situation, along with freeloading squirrels. “Wildlife pressure,” was how a spokesperson for the Texas Pecan Growers Association delicately put it. And now China: most of the high quality pecans go for export, and China is the biggest customer. Called “bi gen,” which sounds similar to “pecan,” they are sold in bagfuls in street stalls and grocery stores, and are especially popular around Chinese New Year, which falls in January this year. Enough about pies! 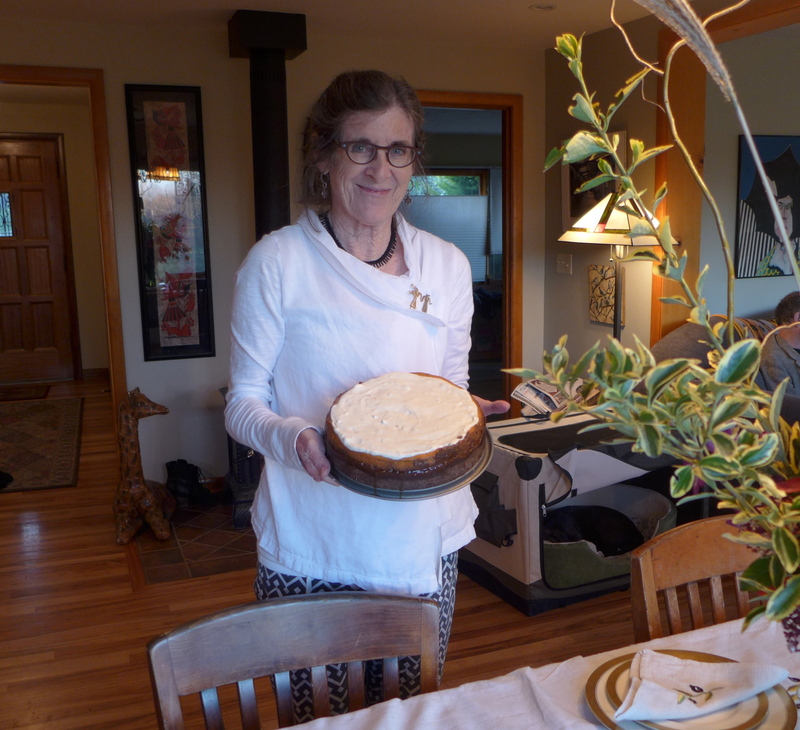 If you are wondering about my holiday effort to produce a pumpkin-ginger cheesecake for Thanksgiving, I can tell you it was a mixed success, from a social/marital point of view. Michael does easily share his kitchen, at least with me, and he was busy preparing his own contribution to Thanksgiving, an appetizer he called “French tacos.” I just wanted to be left alone, in quiet, with my recipe (which I completely misplaced and had to print out again from Glutonforlife website). Yet I needed to ask him if we had a hand mixer (no), small measuring cups (no), a can opener (yes), and if the oven temp was accurate after my cheesecake was far from done after the prescribed hour (yes, but it still went 1.5 hours, caramelizing the crust). I forgot to read the instructions about how to mix the ingredients, and ended up with everything in the blender, in stages. A big mess. I was surly, Michael was annoyed, but by the time we left for our friends’ house, a truce was declared. Thanksgiving dinner with Bruce and Nancy and their family was a big success. Oh, and the cheesecake was delicious, (but so rich we had to take a long walk today to burn off some calories). This entry was posted in Portland, Uncategorized by . Bookmark the permalink. Punkin Ginger Cheesecake..yummy yummy gum drops!!!!!!!! Thanks for the post! It seems like you had a good day after all! I made my mother’s apple pie, as requested by my son, who claims that we must have his abuela’s pie. I have never been a good baker, but I try and they usually turned out good. Wished we could have gone for a walk … We had six inches and temps in the teens but everyone came. Luckily, the guy who snows plows came around 6 am and I had time to shovel the walk. Every time I do this, I end up crying thinking that John never allowed me to shovel and how much my life has changed since he died. Hi Grace: Brings back memories of my years in nearby Batavia (snow capital of the world?). Happy holidays. The cheescake was great and everyone loved it. 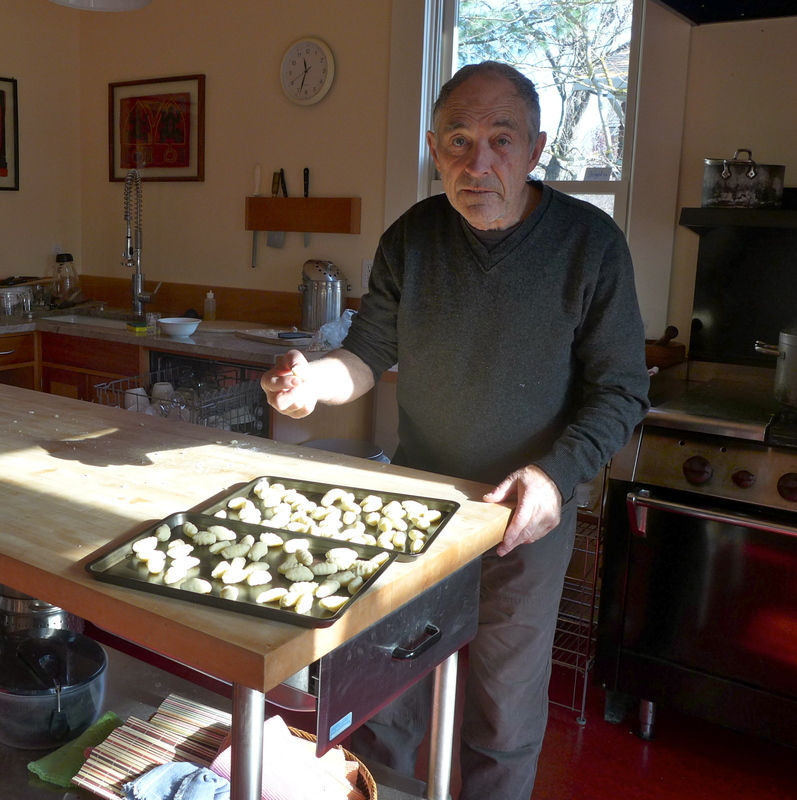 But a little goes a long way; we left half with the hosts and have enough for another dinner party on Sunday. ¡Una delicia de indulgencia! Thanks for being a part of it, from afar. And yes, I’ll try pumpkin custard next year! Greetings from a misty frozen but magical Norway. No pecans here. Indeed, no thanksgiving. We are in jet lag mode, watching a binge of Bergman on TV and reading through the night. And indeed you must ask yourself, given earlier strands of history, should I tempt fate by sharing the kitchen? It is great that we are all allowed to delete bad things from the past, however, and I am all for getting women back to the kitchen from time to time, but not tooooo frequently. Toronto launch was great, with the top floor of OISE and a red sunset in the west. The lit crowd who showed up were Jane Springer, Maureen Fitzgerald and her partner Amy Gottlieb, filmmaker. Montreal was great too, a more French culture today than 25 years ago. Send me details of your trip when you’ve recovered from jet lag. Any photos? As always Judy, a lovely post full of warmth and wit (and a great image of Michael prowling and possibly even growling in the kitchen as you tried to make your cheesecake!) I’m also glad you gave a mention to the importance of recording stories. A few years ago, I interviewed my parents (separately) about their childhoods and their WWII experiences and then wove their two (very different) stories together on a CD for all their grandchildren. Then, at their 50th wedding anniversary I got my nephews to interview my parents about how they met. Again, we did the interviews separately and then wove the (sometimes conflicting) narratives together, with links by the two little boys. The result is enlightening, touching and at times, hilarious ! They’re incredibly precious recordings for all of us and I’m so glad we did it. So tell Michael to get talking NOW! Hi Judy and Michael! So good to see photos of you two in the kitchen. Brings back such sweet memories of being in the kitchen, mostly watching, Michael create something wonderful. I always enjoy the Chronicles and hearing what you are up to. Happy Solstice and Winter. Miss you both. C.
good to hear from you cheri. Yes, Michael loves his kitchen! Enjoy the holidays!